The energy efficiency of your house is dependent on a combination of many different factors, all of which essentially boil down to two main culprits: Air flow and heat loss/gain. There are all kinds of short-term quick fixes for problem areas. Your mileage may vary on those. 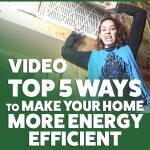 This is a list of five truly effective, long-term ways to make–and keep–your home more energy efficient, and thus save money on energy bills well into the future. #5– Change your air filters regularly. Your home’s heating and air conditioning system needs optimal air flow to function efficiently. When air filters get clogged up with dust, they don’t allow as much air to flow through. Simply replacing your system’s filters on a monthly basis will not only keep you breathing cleaner air, but it will allow your air handling unit to move air efficiently. Thus it will heat or cool your home more efficiently. #4– Seal up gaps around doors. Doors are notorious places for bigger gaps to open up. They’re designed to have a small gap around the door slab itself so it can open and close easily. But as the house settles, the door frame can shift ever so slightly, and make that small gap a lot bigger, and allow outside air to leak in. Or sometimes–and I speak from experience here–a puppy might chew up the weatherstripping around the door frame, rendering it pretty much useless. So do check your weatherstripping and replace it if necessary. And, if every winter you have a draft-stop or towel on the floor in front of the door, you probably need to replace the door’s threshold and/or door sweep. Another solution is to check out adjustable-threshold doors such as those offered by ProVia. #3– Tune up your heating and cooling system. Just like your car’s engine, your home’s air handling system needs some intermittent TLC to keep it running efficiently. Your inside system will settle a bit along with your house, creating possible air leaks in your ducts. Your outside system is subject to… well, to OUTSIDE, and can sustain wind and hail and heat damage, creating coolant leaks, bent fans, etc. Proper maintenance will insure maximum efficiency. However, like your car, even with regular maintenance, the older it gets the less efficiently it runs. Consider setting aside funds to replace systems over 20 years old. #2– Add insulation to your attic. Generally the thicker and ‘fluffier’ the insulation, the better it keeps the temperature inside your home where you want it. Cellulose insulation settles quite a bit over time, so it gradually loses its efficiency. Regardless of your insulation type, if it’s been more than a year since you checked, grab your yard stick and climb up in the attic. You should have a very MINIMUM of 12 inches of insulation. If you have fiberglass batts–wonderful! They tend to keep the R-Value printed on them for decades as long as they are not compressed by something heavy on top. However, consider adding loose-fill (blown-in) insulation on top of your batts to fill in gaps. Did you know that in the average house the biggest source of heat loss in winter and heat gain in summer is your windows? Most houses these days have standard double-pane windows, which are terrible insulators. Better than single-pane, but not much. If you can definitely notice a temperature difference when you stand beside a window in your home, that window is definitely allowing the outside temperature to radiate in. 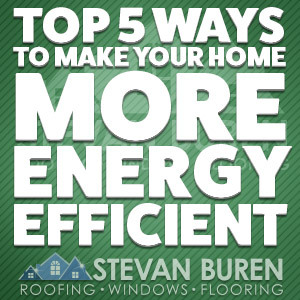 Energy efficient windows are hands down the best thing you can do for your home. Technology has shot forward so much that you can now buy windows for your home that are just as insulating as solid walls. 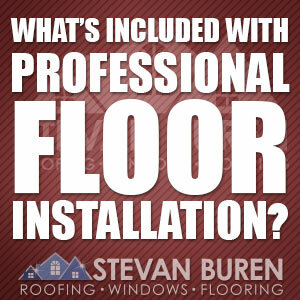 Stevan Buren Roofing, Windows, & Flooring offers the full line of Kensington HPP windows. With pricing competitive with big box stores, we can offer much higher efficiency ratings.